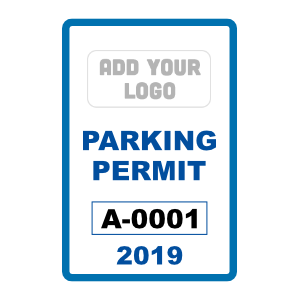 Vertical Rectangle Parking Permits with Your Logo | Free Shipping! These custom vertical rectangle parking permits are the ideal way for you to monitor who parks in your lot! This versatile template can be customized to fit a variety of uses, including schools, hospitals, employees, apartments, special events and more. It's easy to upload your logo and change the design's text, colors, and artwork using our online sticker maker. Our custom vertical rectangle parking permit stickers are high quality, weather resistant and very affordable. They come in a variety of shapes, sizes, and materials. We offer free shipping, free lamination and wholesale pricing on bulk orders, so the more you buy, the more you save! Ordering a custom parking pass has never been easier.